This ProX XSFP-12x12-16 Portable StageX package gives you a stage that's 12FT x 12FT x 16". It includes (9) 4' x 4' Non-skid Industrial finish surface Stage and (9) 16" risers. The ProX StageX is the best solution for anyone looking for durable, dependable and affordable stages. Each StageX platform is constructed from an all-aluminum extruded frame, The Surface is constructed with 5/8 inch high-density plywood with 6061T6 aluminum profile on all sides and is able to support up to 185 lbs./sq. ft. (900kg/sq. meter) of evenly distributed live load. Each stage is equipped with an integrated platform interlocking system; the locks are built into the frame for quick connecting of multiple stages to one another and also allows easy set-up of risers. 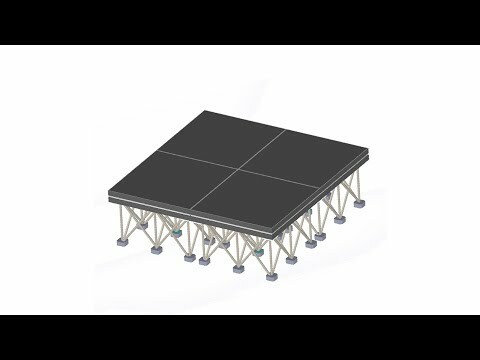 The StageX Portable Stages are strong, easy to set-up, have a professional appearance. StageX Black Stage Skirt 16"